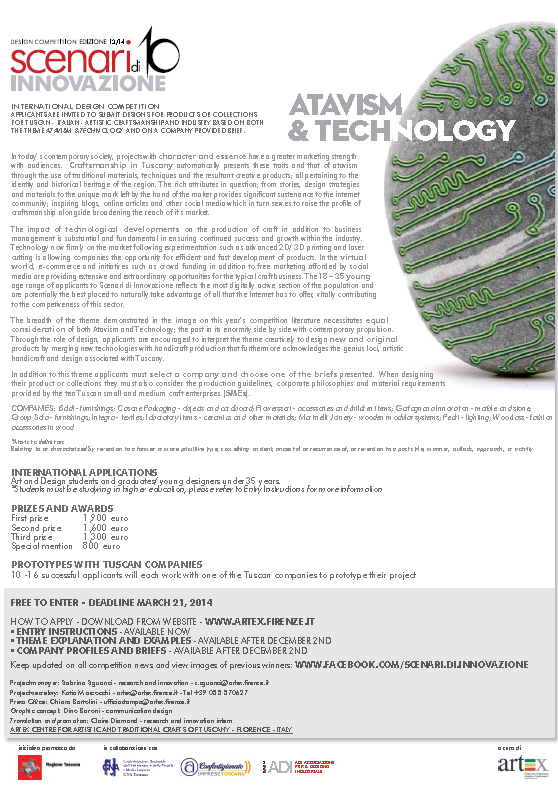 Here’s another competition brief for students and young graduate designers: Artex, the Centre for Artistic and Traditional Handicrafts of Tuscany, is calling for entries to the 10th edition of their “Scenari di Innovazione” design contest. The competitors are invited to submit innovative designs for one of the participating Italian companies, according to the “Atavism&technology” theme and a brief provided by each company. The submissions can use a variety of materials and techniques and they are eligible to win one of 4 prizes amounting to a total sum of 5600 euros. The deadline for entering the competition is March 21st 2014, and the award ceremony and final exhibition of winning projects will take place in April at the International Craft Show in Florence. For more information on how to enter the competition, visit the Artex website.